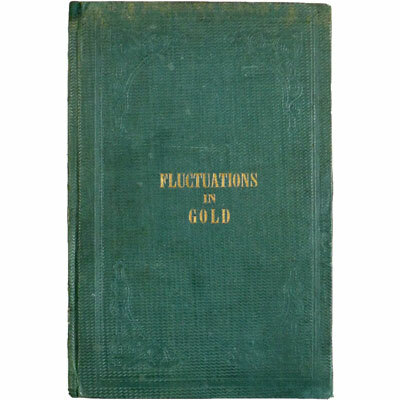 Fluctuations in the Price of Gold in 1863 - J. P. Howard 1863 - Snyder, New York - Entered according to an act of Congress in the year 1863 by J.P.Howard in the Clerk’s Office of the Southern District of New York. ‘These quotations are taken from the CASH Sales at the New York Stock Exchange when price is advancing the highest rate for each day is given, when declining the lowest. Entered according to an act of Congress in the year 1863 by J.P.Howard in the Clerk’s Office of the Southern District of New York. 1 Jan 135 [1982 -101] 31 Jan 161 [1982 -103] 2 Mar 171 [1982 -102] 1 April 159 [1982 -102] 1 May 150 [1982 -102] 1 June 147 [1982 -103] 1 July 145 [1982 -109] 1 August 129 [1982 -115] 1 September 128 [1982 -117] 22 September 137 last entry on the chart. 1 October 1982 122. 1st November 1982 130. 1st December 1982 131. 2-6 Mar 171-150 Passage of the law taxing transactions in Gold. 21-26 Mar 154-139 Favorable News from the Mississippi. 26-1 April 139-159 Unfavorable news from the Mississippi. 8 April 146 - Iron Clad attack on Fort Sumter. 7 May 155 Battle of Chancerllorsville. 25 May 143 Reported capture of Vicksburg. 15 June 148 Rebels in Pennsylvania. 4 July 138 Battle of Gettysburgh. 7 July 133 Surrender of Vicksburg. 18 July 123 Surrender of Port Hudson [in 1862 on this date Gold prices had risen to 120].